Elemental hand analysis differs from traditional palmistry in that it uses different symbolism and terminology. In cheirology or elemental hand analysis, we use the elements as our basic language or symbolism. Once you get used to thinking in terms of the elements, you can use them not only to describe every feature of the hand, but also to describe everything around you! Every feature of the hand can be analysed according to an elemental correspondence, or a combination of elements. 5 element chirology looks at the hand as a whole, combining and comparing all features. It takes a more analytical, scientific, holistic approach than traditional palmistry. Instead of using the planetary names, elemental hand analysis uses the five elements Earth, Water, Fire, Air, Ether to interpret all features of the hand at all levels. Cheirology mainly deals with 5 different aspects of human life. They are known as the five levels, worlds or realms. Each level represents an important facet of our being. Earth – the physical level – reveals things about your current health, predisposition to illness, diet, lifestyle, possible causes of ill health. Potential illness can appear on hands before physical symptoms develop, so can help us to learn about our physical body and prevent future ill health. Water – the emotional level – is about relationships, emotional and sexual needs and difficulties, patterns of interacting with others. Fire – the creative level – what kind of work and working environment suits you, hobbies, activities, career guidance based upon skills, talents, abilities, interests. Air – the psychological level – helps you to understand yourself, your character & personality traits, mental skills, educational advice – which courses / studies would suit you. Ether – the spiritual level – indicates the type of spiritual or religious values, beliefs and practices which may suit you and assist in your spiritual growth. You can interpret every feature of the hand according to the five levels, so whereas in palmistry we tend to concentrate on one level, i.e. each line or marking having one meaning, we now have 5 ways of interpreting everything. Here is a link to an article (pdf format), reproduced on my website with permission from 'Kindred Spirit' magazine who published it in 2006.
an Introduction to 5 element Cheirology. I think we discussed it on the Johnnny Fincham hand reading...that air hand is one where finger are about 80% length of the hand...can you confirm if this is right? also is there something like an ether hand also...if yes.....how is it identified? I think it would be nice if we are able to present in this discussion a photo + handprint examples of hands that perfectly reflects the typical elemental characteristics (featured with a summary of the visible elemental characteristics!). Lynn, do you have such photos available? Martijn, when you ask for photos that perfectly reflects the typical elemental characteristics (featured with a summary of the visible elemental characteristics!). which element characteristics are you asking about ... handshape? or other hand features too? @Lynn wrote: Martijn, when you ask for photos that perfectly reflects the typical elemental characteristics (featured with a summary of the visible elemental characteristics!). which element characteristics are you asking about ... handshape? or other hand features too? I was thinking about photos where most of the major characteristics (handshape + finger length + handlines) related to one element. And if possible, maybe you can also point if any of the dermatoglyphics relates to the most dominant element. 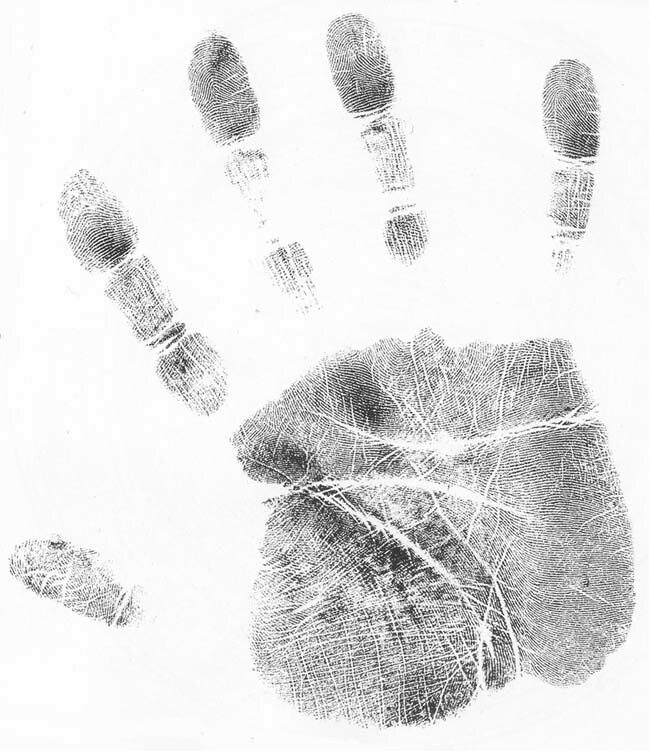 For example: a photo of a typical 'earth hand' (square palm + short broad fingers + basically only featured with the major hand lines) featured with arch fingerprints... that would for a start be an excellent 'illustrative' example. I hope this idea now makes sense for you? Yes the idea makes sense, but it isn't as simple as your request suggests most hands are a combination of all 4 elements in varying degrees! & I'm not sure how the illustrations would help people to understand 5 element chirology, without a lot of explanation. I was hoping to start with handshape but (where is the "darn" emoticon?!) I just remembered.... I can't post the handshape photos that I use in my teaching course, because some of them were kindly courtesy of Arnold Holtzman, only to be used for my private teaching and not to be reproduced publicly. Guess I'll have to sort out my handprint collection and scan some in. Yes Lynn, I understand that it is not easy to present examples which only have 'classic' elements characteristics. - palm width vs. palm length ratio = 95% - while the average palm width is much smaller than the average palm length: the average ratio is close to 77%. - middle finger length vs. palm width = 80% - while the average middle finger length is only a bit smaller than the palm width: the average ratio is close to 97%. - middle finger length vs. palm length = 77% - while the average middle finger length is about 3/4 of the palm length, which implicates that the average is close to 75% (normal range = 72% to 78%). - the width of the 3 primary lines is wider than the other lines. - the fate line (= minor 'earth' line) is the most dominant line of the secondary lines. - arch fingerprint on the index finger (= 'water' finger). - all 5 fingers together display only 4 triradii. - the fingerprint loops on the other fingers have a low 'ridge count'. - the palm has only 4 triradii. - In a typical 'earth' hand the major palmar lines are very broad (which is not seen in this example) + the accessory lines are also broad & short (which is not seen in this hand either): this implicates that in this hands the lines also have some 'fire'-like characteristics. - In this hand the middle finger (= 'earth' finger) is the least dominant finger: the thumb + ring fingers (= 'fire' finger) are the most dominant fingers. - In this hand the 4 loop fingerprints relate to the element 'water' (while the 'water' finger is dominated by an arch fingerprint - an 'earth' characteristic). - Pinky finger is strong, which relates to the element 'air' + a relatively strong mercury line (= minor 'air' line). CONCLUSION: 'Earth' is by far the most dominant element in this hand (let's say... 60%); the 2nd most dominant element in this hand is 'fire' (20%); the elements 'water' (10%) and 'air' (10%) are least dominant. EDIT: PS. If the middle finger (= earth finger) had been more dominant compared to the other fingers, the 'earth' percentage could have jumped to 70% or even 80%! This analysis is only an 'attempt' - so... please feel free to correct my observations and/or add other specific comments!! Thanks for posting an example of some earthy hand features Martijn. Not sure how you reached your percentage conclusions? Not that we use such precentages in 5-element hand analysis, but I would give this hand more than 20% fire. The skin texture is difficult to ascertain from a picture/print, but appears to be fire. Fire width lines, fire length air line (fading into air length?). Another consideration would be flexibility, which we can't see from a picture. Regarding the percentage of 60%, it is only my 'wild guess'... but based on an analysis of the 5 dimensions that I mentioned (I accounted each dimension for max. 20%). 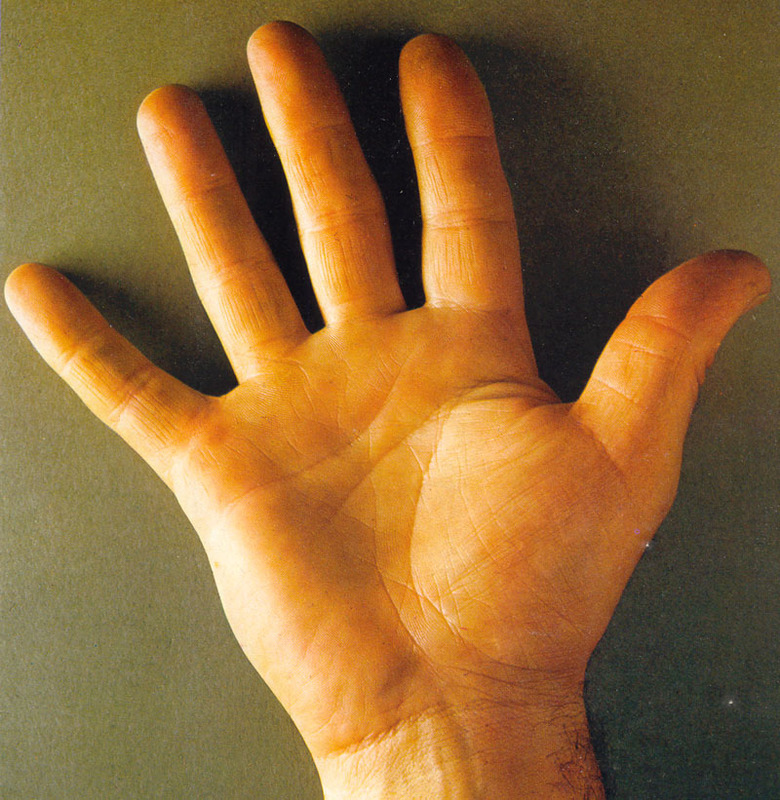 This hands shows only in 4 dimensions some 'earth' characteristics, so in that sense it is not a typical 'earth' hand. By the way, using this approach it should be much more easy to find a typical 'air' hand or a typical 'water' hand... simply because in the fingerprints 'earth'- (arches) and 'fire' (tented arches) characteristics are far less common. Yes, I understood that basically the % were a 'wild guess'. Very few hands are archetypal in all aspects. Rather we assess each individual feature with regard to the elements, to see how people use each element in various areas of their life eg how it manifests in their character, personality, psychology, behaviour, thoughts, emotions, creativity, spirituality, preferences, etc. Elemental strengths and weaknesses, conflicts. Things they might do to balance out the elements. etc. Yes Lynn, I understand (and I realize that it's not the first time that we shared some thought about this aspect of the elemental system). I guess what you're saying is... yes, there are 'earth' handshapes, lines, fingerprints, etc... but this is no such thing as an 'earth hand type' (at least, not according the tradition in the elemental system). Okay, that's just fine with me. But I would like to add one more comment... for, IF my initiative would evoke any confusion, then I think it is due to the fact the elemental system does speak about 'earth people' (+ 'water people', 'fire people', etc.). Then I am wondering: how can one recognize 'earth people' via the hand? ...By 'hand shape' only? Or is this an unanswered question? NOTICE: I am asking these questions because the logical consequence of your feedback is sort that beyond 'hand shape' all other hand characteristics are excluded for recognizing 'earth people'... or is this possibly a missing element in the theory? Or is the idea about 'earth people' maybe just a theoretical concept??? PS. Lynn, I realize that I described quite a few questions in this post, but I want you to know that answering just one of them... might be enough to answer them all! I guess I haven't explained it well. Actually all hand characteristics are included! We tend to talk about 'an earth hand' being earth hand shape, but that alone wouldn't make them 'an earth person'. Yes there is such a thing as an archetypal earth person, water person, fire person, air person. and yes the more earthy hand features they have, the more earthy the person would be, as you suggested in your % in the example. Sometimes it is possible to simply glance at a hand and notice many characteristics that are ruled by one element, and the person will live many aspects of their life and character by that dominant element. I guess we could draw up a 'phantom picture' like the ones you made for Down's syndrome etc that would show 'earth type features' 'fire type features' etc. Lynn, that is a great idea, I expect people will very likely enjoy to see such pictures for each of the 4 elements. "Looking for a 'typical' earth/water/fire/air hand .... might even cause confusion, eg people might think that an 'earth hand' should have arch fingerprints, rather than seeing arch fingerprints as an earthy feature on any handshape"
Yes Lynn, I think I understand your point about the confusion - but I also think that any confusion would likely be related to (mis)understanding the difference between 'earth hand' requirements and the additional features that relate to the element 'earth'. Obviously, arch fingerprints are not a requirement to recognize an 'earth hand'. But what's next beyond the 'hand shape'... ??? Only a long list of hand aspects? For example, on page 69 in Jennifer's book there are a few guidelines for how to create an elemental 'hand chart, starting with': "Take each feature and pattern of the hands and write down your findings"... but obviously Jennifer, you and I realize that there are literally 100's of variables in every hand. But, ... how 'practical' is this first guideline really? I guess the reason why I have started discussing this issue is that there appears to be no theoretical concept nor hierarchical practical quidelines about how to evaluate the SUMMARY of individual hand characteristics. Though from your words I understand that the typical 'earth hand shape' (square palm + short fingers) is one of the major requirements. Just to illustrate what appears to be missing... for example: in Richard's life purpose theory specified combinations of the 10 fingerprints (+ 'gift markings') are key elements. But beyond 'hand shape'... what's next in the elemental-approach? So, Lynn I think I fully understand your point about confusion - but since you and I are willing to answer questions... I don't see much reason to fear the consequences of what we are discussing here. @Martijn (admin) wrote: Yes Lynn, I think I understand your point about the confusion - but I also think that any confusion would likely be related to (mis)understanding the difference between 'earth hand' requirements and the additional features that relate to the element 'earth'. Correct. The confusion can come between 'earth hand (shape)', 'earth hand features' and 'earth type person'. Ok lets start with hand shape, 4 pure element types of handshape (discounting 'combination hand shapes). Next maybe skin texture, 4 more element possibilities. 4x4=16, already we have 16 possible combinations. Now maybe fingerprints (to make it easy lets assume all fingers are the same type of print), 16x4 = 64 possible combinations so far and we only looked at 3 aspects of the hand,... Next feature will bring 256 possible combinations....and so it goes on. Thousands (maybe millions!) of possible combinations. I guess the reason why I have started discussing this issue is that there appears to be no theoretical concept nor hierarchical practical quidelines about how to evaluate the SUMMARY of individual hand characteristics. Richard's only looking at fingerprints. Holistic hand analysis is much more complex! You can only summarise once you have analysed every aspect of the hand. We are all individuals, so every hand analysis summary will be slightly different in some aspects. Though of course you can sum up generally which is their strongest / weakest element, which one they take for granted, which one they neglect or ignore, which one they put the most effort into, which one they fear, which one they would benefit from developing more... etc. Okay, so after (1) 'hand shape' ... one can consider (2) 'skin texture' + (3) 'fingerprints'. 'Hand shape' + 'skin texture' ... I think that is a nice combination (combining the biggest elements with the smallest elements). I think we at least arrived at an interesting + sensible point... thanks Lynn!! Sorry, my apologies - when I said "Richard's only looking at fingerprints." I meant in the summaries he uses in your example: in Richard's life purpose theory specified combinations of the 10 fingerprints (+ 'gift markings') are key elements. . Of course I know that Richard is very experienced in studying all aspects of hands. edit, I like the term Richard uses on his page about handshapes - building blocks. That is indeed what we are doing when looking at the elements - each feature is another brick in building up a picture of the person - or another piece to the jigsaw. where were those "average" statistics taken? what sample? I ask this because I think there is a difference between "average" middle finger length in a population, and "medium" finger length. eg in Western world fire hands predominate, which have shorter fingers (around 75% length of palm). Against air hand which have long fingers, 85% length of palm. So the "average" eg in Uk would be smaller than the average in a country where water or air hands predominate. according to your stats then this finger is "average" not "short" ? (I know you also measured it against width of palm, which in 5 element handshape only comes into secondary handshape classification for combination hands). Sorry, I know we had this discussion before, but it was lost with Sue's forum! Lynn, the 75% [normal range: 72%-78%]... was one of the results that I concluded during that discussion (actually, a few weeks ago I saved the full discussion with the help of google-cache). - middle finger length vs. palm length = 77% - while the average middle finger length is about 3/4 of the palm length, which implicates that the average is close to 75% (normal range = 72% to 78%)." I described there 2 aspects: according the first aspect (palm width) the finger is definitely short, but according the second aspect (palm length) the finger is average. However, since we are talking about a relatively 'squarish (= short) palm'... I would be sensible to correct the average for the second aspect! That's why the second aspect sort of can be ignored here... actually it would be wise to correct for both aspect... but obviously, even after correction according the first aspect the middle finger in my example is definitely short (80% is soóóó far away from 98%!!!!). Yes I "sort of" understand Maybe I should take more notice of finger length vs palm width in all hands, not just borderline/combination ones. After reading through this thread, I think another there's another skill requirement of a good 'elemental' palm reader - math.